MINNIE: Hiya, boys! 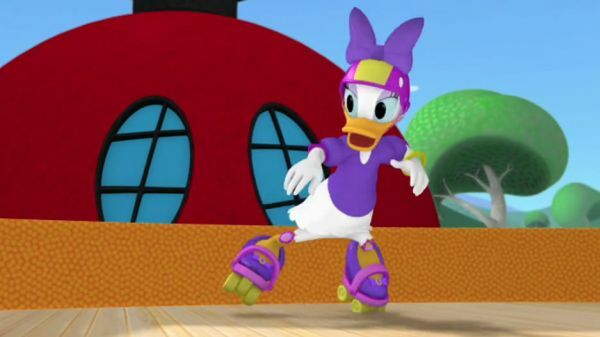 Give us a little room, because Daisy and I and Hilda are gonna practice our roller skating act! Oh! One skating rink, coming up! 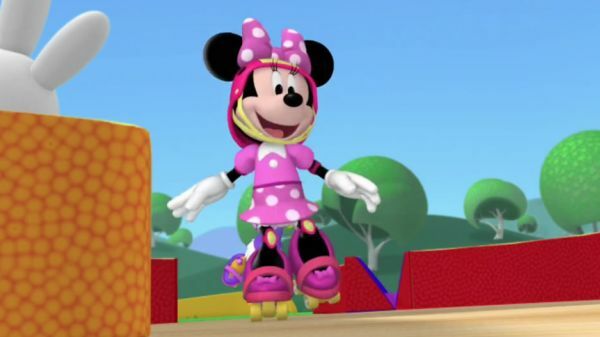 MINNIE: Skating around is lots of fun, we'll disco skate until we're done. 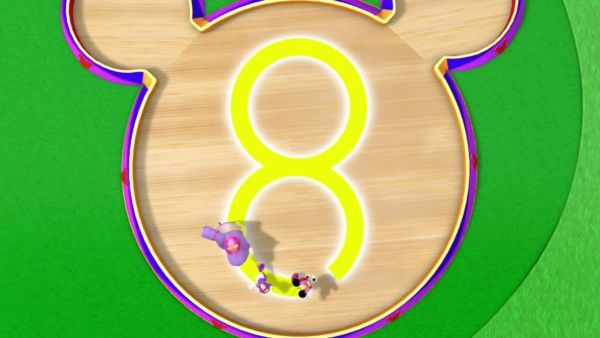 MINNIE: Come on, let's skate and make a perfect figure eight! BOTH: Ooh, la la! Ooh, la la! 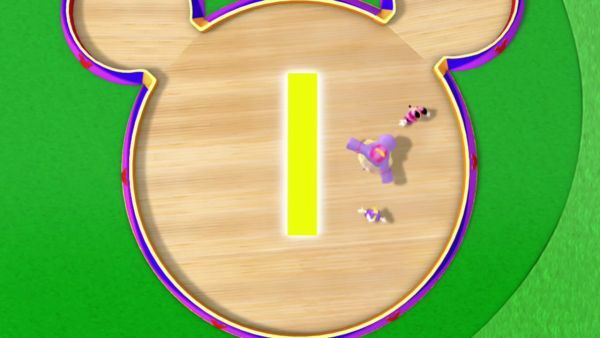 DAISY: Oh now, let's skate an 'O', a circle or a zero! BOTH: Ooh, la la! Ooh, la la! MINNIE: And then we'll be all done lined up like number one! BOTH: Ooh, la la! Ooh, la la! Oh! DONALD DUCK: Oh, boy, was that good! PLUTO: Yeah! DAISY: Oh, goody, goody! I guess you like our talent act. DONALD JUNIOR: Uh, huh. MINNIE: Oh, what a sweet duckling! What's your name? MICKEY MOUSE: We're calling him Donald Jr.! DONALD JUNIOR: Uh, huh. DONALD DUCK: And we're teaching him to dance and sing! 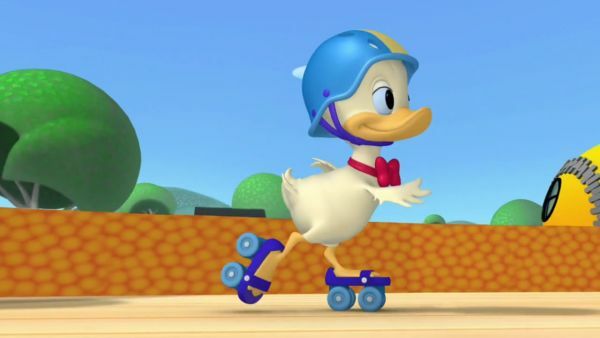 DAISY: I think Donald Jr. wants to disco roller skate with us! DONALD JUNIOR: Whoa! MICKEY MOUSE: Whoa! Be careful, little fella! HILDA: Ah! MICKEY MOUSE: Junior! DONALD DUCK: Whoa...! MICKEY MOUSE: Whoa! HILDA: Oh-ho-ho-ho-ho! DAISY: Here comes Hilda! MINNIE: Look out! MICKEY MOUSE: Yikes! Runaway hippo! DAISY: Oh, oh, watch it! MINNIE: Oh, dear, we need something to help us stop Hilda and give her a soft landing! DAISY: We need a Mouseketool! Quick, everybody say: oh, toodles! ALL: Oh, toodles! 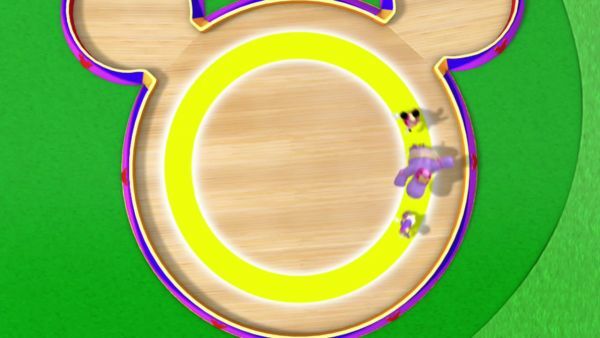 TOODLES: Hap-hap-happy to help you! MINNIE: We have the rescue truck, a giant marshmallow, and the mystery Mouseketool. 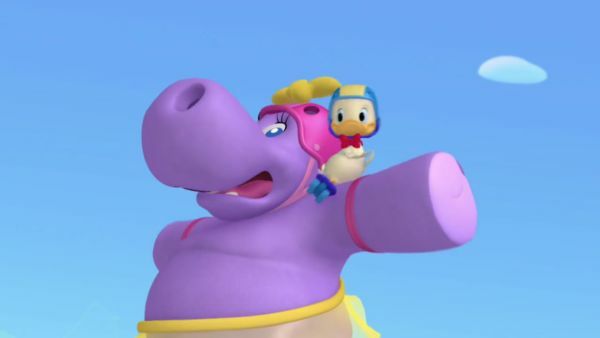 Which Mouseketool can help us stop Hilda and give her a soft landing? DAISY: The giant marshmallow! It's big enough to stop her, and it's soft and squishy to land on! MICKEY MOUSE: We've got ears, say cheers! DONALD DUCK: Whoa, whoa, whoa, whoa, whoa, whoa! HILDA: Oh, oh-ho-ho! Oh-ho-ho! DONALD JUNIOR: Hooray! 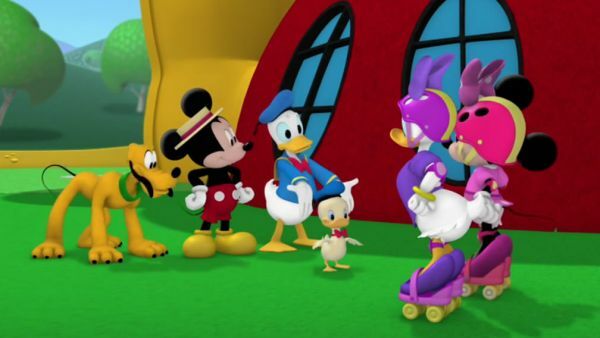 MINNIE: Oh, good job, Donald! DAISY: Oh, goody, goody! 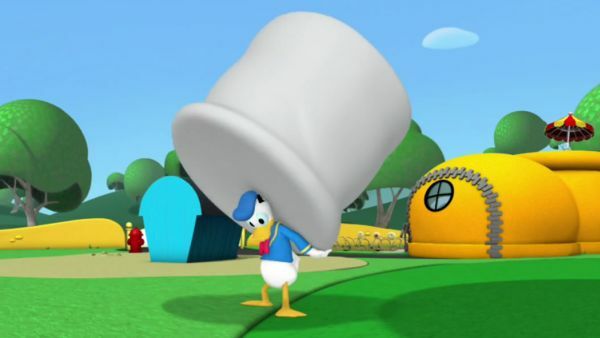 DONALD DUCK: Why does this always happen to me? DAISY: We're off to practice more. 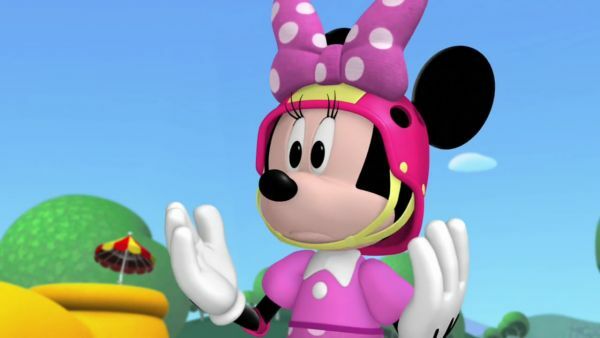 MINNIE: See you later at the show, boys! 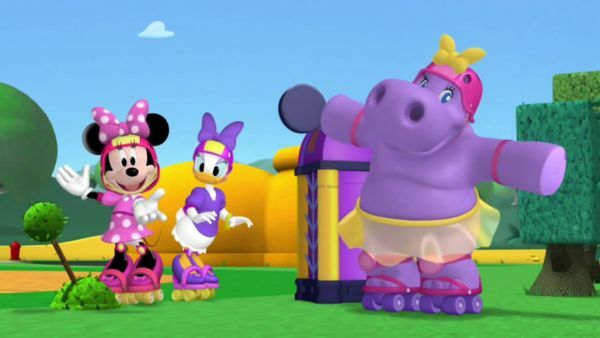 MICKEY MOUSE: Time for us to practice, too. Come on, let's dance! DONALD DUCK: Ok, Junior. Follow me! Step, step, step, step! Kick this way, kick that way! Spin and wiggle, wiggle, wiggle! Step, step, step, step! Kick this way, kick that way! Spin and... DONALD DUCK: Aw, phooey! 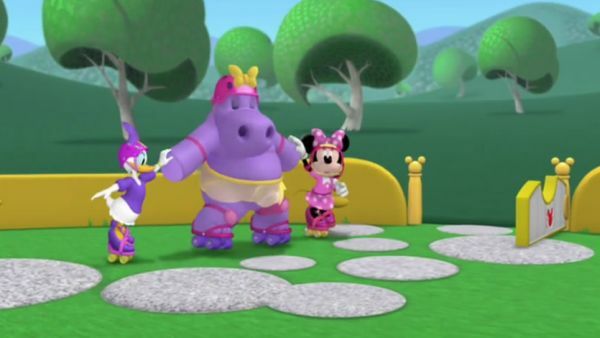 MICKEY MOUSE: Gosh, fellas. Learning takes time and lots of practice.